In small bowl, mix dressing ingredients; set aside. In wok or 12-inch skillet, heat 1 tablespoon vegetable oil over medium-high heat until hot. Add bell pepper, carrot and green onions; cook and stir 3 minutes. 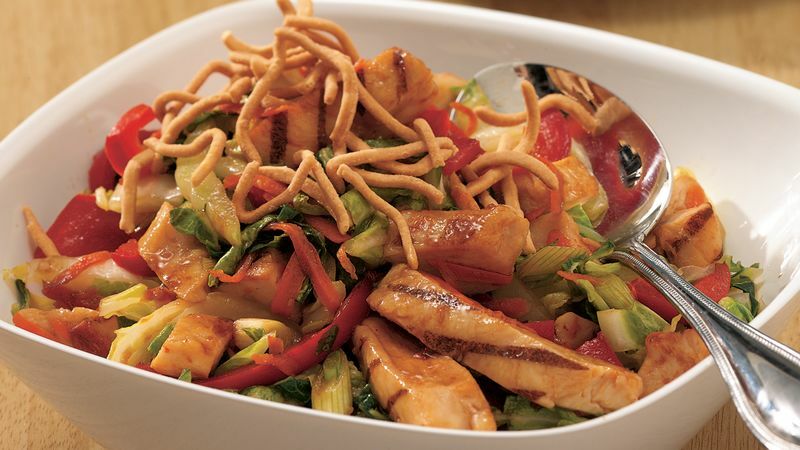 Add chicken; cook and stir 1 to 2 minutes or until chicken is hot and vegetables are crisp-tender. Add cabbage; cook and stir 1 to 2 minutes longer or until cabbage is slightly wilted. Remove wok from heat. Pour dressing over slaw; toss to coat. Divide slaw evenly onto individual serving bowls or plates. Sprinkle with chow mein noodles. Chinese cabbage, also known as Napa cabbage, is oblong in shape and cream-colored with light green leaf tips. For an even quicker dish, prepare all the ingredients ahead of time. Combine the sliced red bell pepper, grated carrot and onions in a plastic container or resealabe food-storage plastic bag. Shred the cabbage and store separately. Make the dressing and pour into a small jar or plastic container with a lid. With all of the prepared ingredients in the refrigerator, you are ready for an instant meal!